Erroneous procurement processes can cause bottlenecks in growing your business. On the other hand, proper management and using of appropriate metrics will help run your everyday operations smoothly. Think of your purchasing department as the backbone of your ecommerce store. I have always told my team that the power of the company lies in the hands of our purchasing department. When they buy correctly, we will always make money. Lack of understanding of inventory level requirements. The team running your purchasing department is responsible for ensuring that merchandise, whether they are finish goods or raw materials, are always available when a customer places an order. 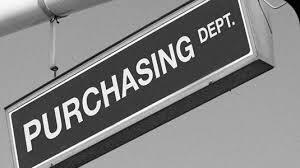 In ecommerce, the purchasing department makes sure that your warehouse or your storefront is always well-stocked. Having too little merchandise leads to loss in revenue and having too much leads to cash flow crunch and stale inventory. Unrealistic timeframe for purchase deliveries. When your procurement manager is unable to determine the exact dates when the supplies/merchandise must be delivered, day-to-day operations are affected. Late deliveries will result to insufficient merchandise on the shelves and lost revenue. On the other hand, super early deliveries will result to storage issues, cash flow issues, and higher cost of goods. This is especially true if the inventory was purchased from a line of credit or in other words, the purchase was financed which is basically poor handling of capital. Failure to select the best suppliers. In selling products, it always comes down to product margins. What does it cost you and how much you can sell it for. Being competitively priced to sell it to your customer means that you have to also buy it competitively. Not seeking the best suppliers/vendors is going to cause your company not only top line sales but also bottom line profitability. Your purchasing department must evaluate all pricing options, look for alternate vendors, and investigate the possibility of finding more competitively priced goods along quality standards that your customers demand and expect. Lack of documented paperwork and accounting. Your purchasing department is working closely with other departments namely accounting and marketing/sales. Receipts and all amounts of purchases must be recorded and verified to ensure that everything is in accordance with the approved budget and overall purchasing guidelines of the company. Failure to have the right assortment. Failure of the merchandiser/purchaser to pick the right assortment of goods will cause confusion to your customers. When merchandising online, it’s important that the right amount of selection is available as well as the range of pricing that allows the customers to decide how much they would like to spend. Too many products in the same price range limit the company in selling higher margin items. For example, if you sell clothing and most of your pricings are at $24.95, then you might have missed shoppers that are looking to spend only $19.95, while shoppers that can afford/willing to pay $29.95 are not optimized. This failure is not isolated to just pricing alone. It can also apply to having too much of one type of merchandise. An example of this is when my company was overloaded with money clips. The money clip category sales were growing, so we kept adding more and more selection. But while we kept adding, we failed to discontinue any of the old ones or the poor sellers. I recall we ended up with over 60+ money clip designs while the guideline called for us to only have 24 designs at a given time for each category. At some point, the sales did plateau and even slowed down. We were forced to discontinue them and lost money on those sales just to recapture our investment and turn our inventory. Adding too many products can cannibalize the sales of your proven products. So I’m sure you heard the Paretto law of 80/20, the key is to know what 20% of your inventory sells 80% and ensure that you don’t do anything that will jeopardize that formula. What are the specific employee touch points before purchase orders are approved? What are the mandatory procedures to place orders with suppliers? What are the required documents to approve the budget for purchases? What are the required reports that must be submitted by your procurement team? What can you do to increase the savings of your company in costs per order? What are your company’s criteria in choosing vendors and suppliers? Truth be told, there is no universal purchasing process for ecommerce businesses. Each business is unique, so my advice is to create purchasing steps that are simple and transparent. Since the people behind your purchasing department are directly involved in the financial transactions of your company, yearly audit is necessary to maintain integrity and accountability.